Over a millennium ago the Vikings were exploring, raiding, trading, and invading their way around Europe and across the northern Atlantic to Iceland, Greenland and even on to touch Canada. They’ve been a little quiet in more recent times, but not so long ago a longship slipped quietly out to sea. Organised and equipped by Henrik of Kobenhavn, the Penol Expedition has sailed in record time from Dansk (Denmark) to the far-away lands of Udgaard. And so just a few days ago I returned home to be greeted “Heil ock sæl” the red Viking “Skjoldungen”, leader of the expedition. So, without further to-do, here is the Penol Party that arrived on my doorstep. Vikings, fanning out across the world. First the Penol P200. Obviously an economy model – hmmm, times have changed, a Viking dressed in fluorescent pink? Odin and Thor are probably rolling their eyes. I don’t know the price of these pencils but assuming the P200 is priced at an economy level then it looks fairly reasonable. Pictured with the P200 we have an unknown model. It is apparently Penol, but they do not put their name or anything on it. They are rightly ashamed of this nasty little side-clicker. The Penol Double-Click. A seemingly respectable vanishing point pencil. The rubber grip is a bit of a monstrosity though. 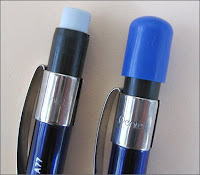 Another fluorescent one, this time the Penol Pastel with a long twist out eraser cartridge. The Penol Elite. Again the rubber grip. Penol definitely seem to like their rubber grips. The Penol Tyre. Grrrr, this is a shocker. Well, I kind of applaud the idea, but the execution is abysmal. It’s just a plain white barrelled pencil and they have glued on the tyre-tread decoration. But the tyre tread is quite raised, about 1mm thick rubber sheet, and it’s poorly glued, so that it’s starting to lift off. Surely a few hours or days of constant use would cause all sorts of skids and crashes as the tread lifted. Keen eyed readers may have noted there is one more Penol in the original picture - . more on that one next time. Whilst this was a Penol expedition, the ship captain was not Penol, and we finish this saga with expedition leader Skjoldungen (newly named Fafnersherre), a sturdy wooden fellow, like his longship. Henrik tells me that back in the good old days there was the Viking Pencil Co, and as he recalls things, they manufactured the Viking in three grades - No. 1 Soft, No. 2 HB and No. 3 Hard. There was an office pencil too, yellow in HB only. No ferules or erasers. Sometime in the 70’s they were discontinued and the Viking factory closed, the end of a piece of Danish cultural history. 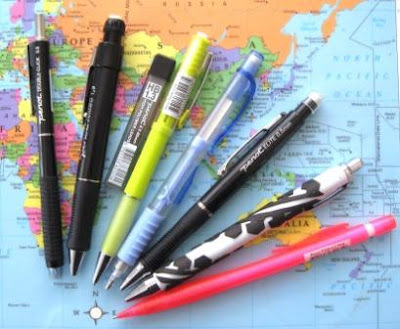 However in 2005, Esselte started to offer pencils under the Viking brandname. Apparently the demand for Viking pencils is rising and recently the yellow office version came back too. So thanks Henrik, another saga for the annals of the people. Apparently the 75 was produced from 1964 to 1994. By the 1970’s they appear to have used 0.9mm lead but mine uses a lead cartridge with 1.03mm lead. That’s a size I’m not familiar with. Being non-metric American, I guess it was called .040 or .041 lead at the time. So, I’m not sure if this means mine is one of the earlier 75’s or they offered two lead sizes, or…? 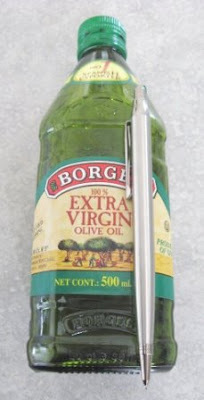 The lead cartridge is basically the same size as a ballpoint refill and contains the ratchet lead advance mechanism. The tip of the cartridge sticks out of the body so you can see the clutch jaws open and advance the lead, etc. Photo - Tip of the cartridge (above), and below showing the tip sticking out of the end of the body when reassembled. By today’s standards it’s a little strange to see this, and it’s not really all that aesthetically pleasing. Definitely the weak point in an otherwise very attractive writing instrument. Hmmm, time to get out the polishing cloth. Probably should have used before the photo shoot rather than afterwards. Firstly I had better say I am not totally sure of the model designation for this pencil under review. I bought it as a ballpoint pen and pencil set, because that’s the only way to get an Inoxcrom pencil in my part of the world. You can buy pens as separate items, but not pencils. 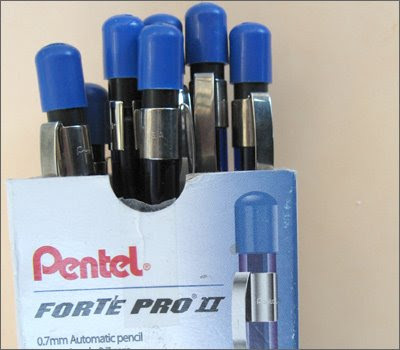 The labelling on the cardboard sleeve implies they are a Model 2002 chrome pen and pencil, but there are other numbers too. Down here, Inoxcrom have a rather unusual distribution model. You basically don’t find them in the normal place, i.e. in stores that sell other writing instruments. Rather you find them in homeware and gift stores, or in that kiosk at the mall that cuts keys, engraves trophies, sells torches, pocket-knives, cigarette lighters and…Inoxcrom pens. 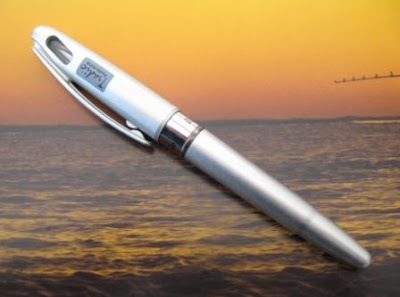 Many of their writing instruments have metal bodies, and the kiosks hope you will take up their offer of discounted engraving on that nice Inoxcrom pen you are giving as a graduation present. Well, anyway that’s how they are distributed in these parts – I’d be interested to know about where you see them in your part of the world. The Inoxcrom website doesn’t really tell you much. There’s a few graphics and so on, a very brief history of the company (started up in Barcelona, Spain in 1942) and not much else. Little to no product information. Their website doesn’t give any hint at the origin of their name, although to my English-speaking (?!?) ears the word “Inoxcrom” sounds suspiciously foreign for stainless steel. All that influence from Victorinox and chrome. 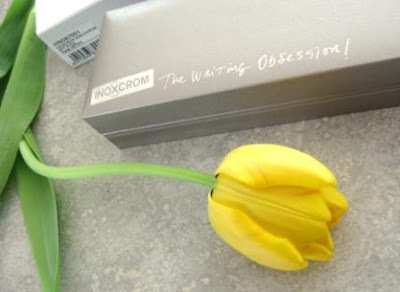 Inoxcrom are certainly the only Spanish pencil manufacturer that I’ve heard of. I usually associate Spain with things like bull-fights, or some nice treats for the taste-buds or for the eyes. Right well that’s a fair amount of general introductory burble, on with the review. I often find metal pencils surprisingly light when I first pick them up. You would think I would have learned from experience by now, but I must be slow. The Inoxcrom is one of those pencils that didn’t surprise me too much when I first picked it up. 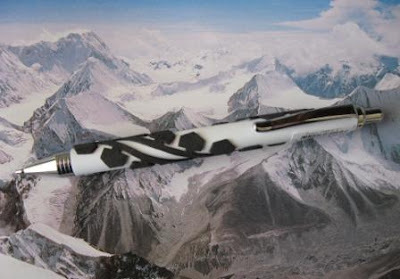 Although it’s a similar weight to many other stainless steel pencils, it is somewhat top heavy so when you pick it up the top heavy balance makes the weight more noticeable. I’m not generally a fan of top heavy balance points, but this is one case where it seems to work well. So, now I’ve picked the pencil up the body is plain stainless steel so the grip is average. The mechanism is a standard push top ratchet, using 0.5mm lead. Ten clicks advances about 8mm of lead. The sleeve is 2mm thin round tube, and importantly it’s a retractable sliding sleeve. Somewhat unusually it takes 3 clicks of the mechanism to fire this pencil up from a standing start. 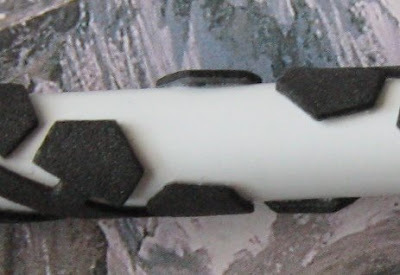 The first click partially advances the sleeve out of the tip, the second and third clicks complete the extension and advance some lead out of the tip. Some folk may well prefer a fourth click to get a decent length of lead ready before they put lead to paper. The other unusual feature of this mechanism is the amount of lead cushioning. It is “extreme” on the Dave scale. The whole sleeve springs in and out about 3mm under reasonably light pressure. Certainly no one can argue that this cushioning doesn’t work, but you often feel the pencil springing in and out in your hand when writing, let alone when you make a full-stop (period). All this movement is a little disconcerting at first, but you do get used to it to some extent. Maybe I’m just heavy-handed? I don’t know whose leads Inoxcrom use, but the leads supplied with the pencil seem reasonable, although some graphite dust often accumulated at the tip and thus occasionally left a little blob on the paper. There is a small eraser under the top button, and there is a hole in the very top of the button so you can see the eraser through it. 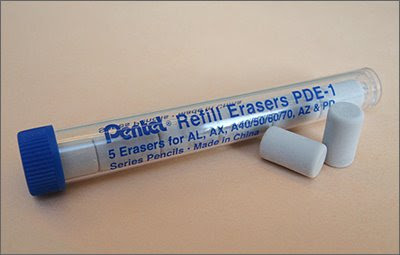 You pull the eraser holder out to access the lead refill chamber. It’s just a plastic tube and the eraser housing press fits securely into it with a bent metal hook pin. Sometimes getting the housing back into the refill tube can be a bit difficult, and as always, I wonder about the longevity of such arrangements. The body sections have brass inserts inside them with good quality fine machine cut threads. This type of construction compares very well with the rolled threads on some competitors, e.g. modern Parkers. Whilst we are looking at the innards, I was half expecting to see Schmidt or some other German name on the internal mechanism, but it is totally blank, so no hint as to its origin. 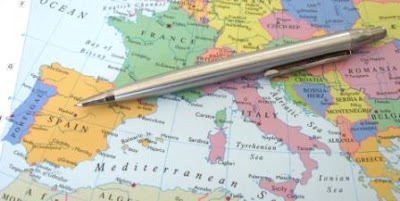 I note with some interest that the markings on the ballpoint pen refill cartridge include “Made in Spain”. The pocket clip is something that really stands out for me. It's an attractive enough shape and is quite strong yet springy, but it’s fixture to the body via an oversize slot just cheapens the whole pencil. It’s a little better on the matching ballpoint pen. Also, I really feel the pocket clip is a lost opportunity. 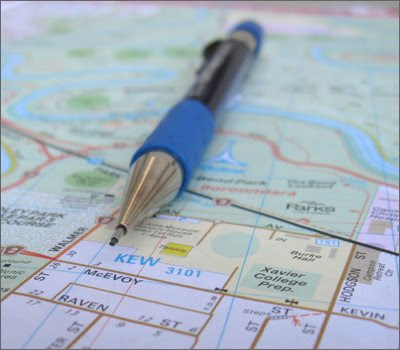 It just cries out for a little brand decoration – like the Parker arrows, the Sheaffer dot, a brand name stamped into it - just something to take it that step up out of the plain generic ranks. For me personally, when I look at the Inoxcroms down at the local kiosk, comparisons with Parker products are unavoidable. In this case the stainless steel Jotter springs to mind. Overall the Inoxcrom appears to match up fairly well, stylistically Parker have probably got the edge, but perhaps Inoxcrom win on features. I can’t comment on how the Inoxcrom will last over the years, whereas Parker has an established reputation, but it’s worth noting that Inoxcrom prominently offer an International Lifetime Guarantee. 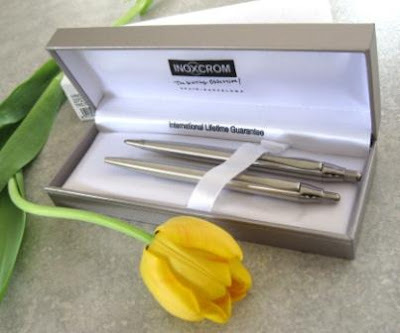 If you are a fan of stainless steel pencils then I would suggest this Inoxcrom is worthwhile adding to your collection. Best Points – Cushioned retractable sliding sleeve. 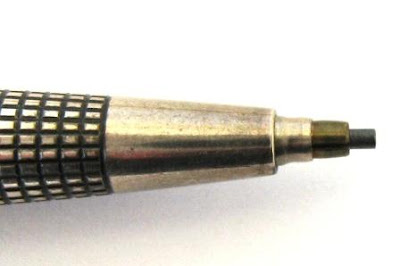 Not So Good Points – The four-click start, fitting the eraser back into the lead chamber. 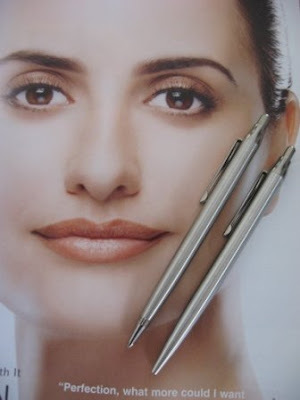 Price Range – Mid for the pen and pencil set. Dimensions – Length 140mm, diameter 9mm at widest part of body or 7 – 8 mm in grip area. Balance point about 85mm up from the tip. I get a small number of hits from Espana and I’d like to hear from any visitors from Spain as to how common Inoxcrom products are in their homeland. The Tradio is a relatively recent addition to my collection. 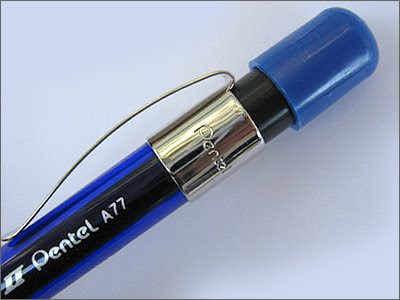 The Pentel USA website declares the Tradio as a special offering from Pentel Europe and they only offer the pencil version in silver colour and 0.5mm lead. 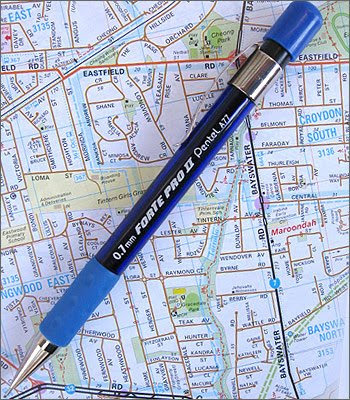 Pentel USA also offers the matching Tradio fountain pen, but this time in a variety of colours. I haven’t bothered to do the research to see what other variants may or may not be available in Europe or Japan. With its cap on, the Tradio definitely has that traditional fountain pen shape and look. Well, at least it does to me. 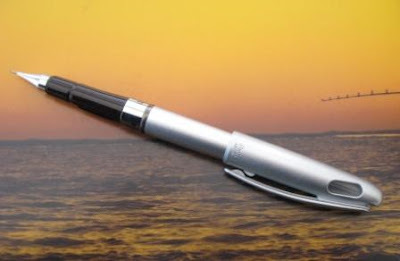 I assume the name Tradio is also part of the play on the traditional fountain pen theme. The Tradio is much lighter than I expected. The size, shape and metallic look all implied something a little heavier to my eyes and brain. To post or not to post, that is the question! The Tradio certainly has enough length that you can use it without the cap posted on the end of the main body. Unposted it looks rather fountain penish in the hand because there is no eraser, push-top button or other such accoutrement on the end of the barrel. The cap is lightweight plastic so if you do choose to post it on the end of the body it doesn’t have a huge impact on overall weight or balance. 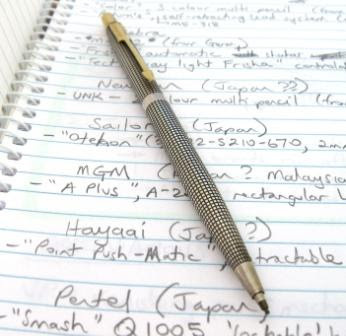 As a pencil user, it certainly looks unusual having a posted “fountain pen” in your hand when you are writing with your pencil. Ultimately I’m not sure which I prefer, so I’ll probably use it both posted and unposted as the mood strikes me. 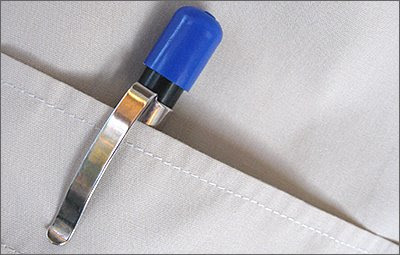 Using the pencil with the cap posted does have one advantage, the pocket clip on the cap stops the pencil rolling on your desk when you put it down. The pocket clip is just an integral moulding of the cap, basically functional but nothing exceptional. 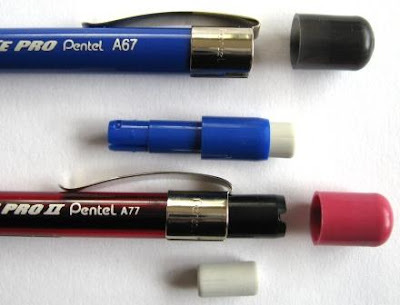 When you put the cap on the pencil the body push fits and clicks firmly into place inside the cap so there are no worries about it coming loose. Well at least when it’s nice and new, but who knows what a good few years of wear and tear will do to that push-fit? There is a clear plastic window section towards the top of the cap and you can see the tip of the pencil through the window. Presumably fountain pen users would also be able to see the pen nib through the window. Slightly interesting, but neither really here nor there. What was the idea? The Tradio does not have an eraser hidden anywhere. The lead sleeve is a fixed thin 3mm sleeve. Definitely not pocket safe without the cap. The lead advance mechanism is a side button ratchet system. Ten clicks will advance 5mm of lead. This is somewhat on the short side and I did notice that I had to advance the lead more often than usual. The side button is right there in the middle of the black front section of the body, right in the grip zone. I certainly did not like that at first, but I tended to get used to it over time. Having said that, it is still a bit annoying as you always have to twist the pencil into the correct orientation when you pick it up, and the button really is “in the way” although you do get used to it. At least operating it is easy given that it is “right there”. Ignoring the whole button thing, this pencil does feel quite good in the hand, although the narrow diameter grip will not suit all people. The grip section itself is smooth hard shiny plastic without any particular grip enhancements. I found that the side button tended to make me a little conscious of my grip, and I gripped it a little lighter than usual. The Pentel website states, “Ergonomic barrel design provides added comfort and control.” Well, “Yeah, right” as we say down here. Just what’s ergonomic about it? I don’t see one of those so-called ergonomic rubber grips, or a triangular grip, or a large diameter grip, or…so what’s ergonomic about it? Looks like this is just pure marketing dross if you ask me. Refilling the Tradio is a little more complicated than most other Pentels. You will not be surprised to find I didn’t receive any refill instructions with my pencil. You unscrew the body in the middle and then pull the chrome cap off the top to access the lead chamber. Last year when I opened up my newly delivered parcel of pencils, my first impression of the Tradio was not a good one. 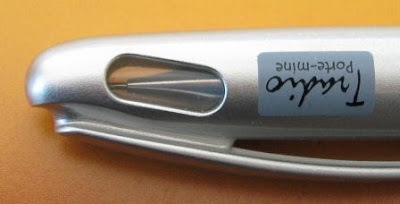 I felt that the silver metallic finish looked rather cheap and, well, “plasticky” for a premium offering from Pentel, particularly considering the price they demand for it. I’m somewhat surprised but glad to say that my week spent using it has largely reversed this negative feeling. The Tradio is never going to be one of my all-time favourites, but I’m now reasonably happy with my purchase. 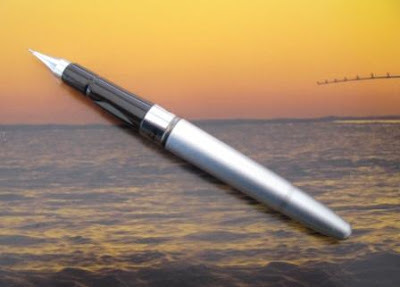 Best Points – Interesting fountain pen look. Not So Good Points – Lead advance button is in the way. Dimensions – Length 137mm capless or about 170mm with cap posted, diameter 12mm at widest part of body or 9mm in grip area. Balance point about 65mm up from the tip when capless.